So Long, Kodachrome is an ode to super 8, and the most beloved film stock every made. While paying huge respects to the format, this original sound super 8 short also pays homage to an American 70′s landmark film. Using four super-8 cameras a man in a white room replicates himself. He and his clones have until the cartridges in the cameras run out before they disappear. Don’t miss this opportunity to see the best of the Festival 2011! Tuesday 29 November 2011, 8pm @ The Commissary. The winner of the 2010 audience prize Lionel Laget will shoot his new film in Cambridge next Monday and Tuesday. For his new film, he is looking for a man to play the college master part and a woman to play a student. He is also looking out for some costumes : roadsweeper + broom, college graduation gown. If you can help or want to be involved, please contact Lionel at l_laget@yahoo.fr or come to the festival and meet Lionel there. A couple of days are left to prebook your tickets. After this, they will be available at the doors on the day of the event. Come and see more short films that we have received for the festival ! It is a unique opportunity as many of these shorts won’t be shown at the festival !!! Even though we’re busy finalising details for this year’s festival we thought we’d take some time out and give you a sneaky peek at some of the great Super 8mm films that we have received. 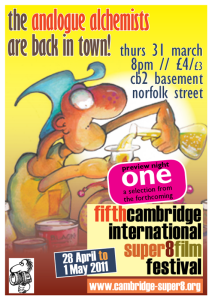 The fun starts at 8pm, so come and join us for a great night of inspirational shorts. 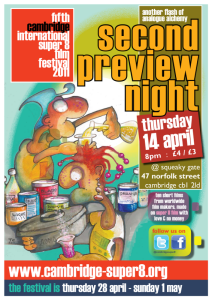 Download the poster of the Festival 2001 preview night. 10 Sep, 2010 in Festival 2011 by G.
Film submissions for the 2011 festival are now open. The deadline for submission is the 26th of November 2010.